Not to mention Verstappen changing his design season after season doesn’t exactly give him much of a memorable “ah that a Max helmet” stamp. As I said, it's a commercial business. People will want to own all scale models of those helmets. You can leave the childish remarks out, I could not care less. but most drivers could come up with simple bold designs and apply sponsors to it. If you look at Verstappen's past helmets the sponsors are all in the exact same spot. I'm pretty sure he has no freedom to just design something and apply sponsors to it. It may vary with other drivers. I think Kvyat must have been reading this thread. Less is more, clean and distinctive, looks great. Kvyat absolute master design. So old school. It can be done after all even with Red Bull branding! Edited by NoForumForOldPole, 11 February 2019 - 19:03. What makes Kvyat’s a design then and for instance Grosjean’s not? Kvyat’s is just a few planes in red and blue, hardly a design if you ask me. I find the likes of Grosjean’s or Kimi’s for example far more creative and more worthy of being called a design. It's all subjective mate, I don't subscribe to a simple helmet being better (although they can be really nice too). Just have a look at Valentino Rossi's helmets. His testing helmet would be considered a mess here (along with a lot of his helmets). I love the test helmet though, even if I'm not a fan of his. I tend to think in terms of football shirts. If you can describe them in four words or fewer - "red and white stripes", "blue and white halves" - they work. If you need to throw in more - "white with black sleeves and a red hoop" - they don't. It's not quite the same with helmets because you're dealing with 3D, and more room for colours but you can describe Senna's easily. Yellow with a blue hoop and a green hoop. Or e.g. Giacomelli (orange with white diamonds), Stewart (white with tartan band), Rubens (white with blue top and red ovals). And so on. Grosjean's is...what? Kimi's is...what? Describe Kimi Raikkonen's helmet identity, let alone helmet. All he really needed was black/dark blue with a big white 7. Instead he's got something that looks like a manga character puked on it. Yeah I always liked Kimi's early Mclaren years helmets and can remember them, the only thing that is memorable from his new ones is that it still has that same symbol on the top the rest I can barely picture. The problem is that all the helmets are basically done by the same person (or seemingly) so the vast majority of them end up with the silly little flicks and stuff which might be cool and modern. But from a fans perspective it's rubbish, I remember as a child drawing drivers helmets, these days if i tried to do that I'd have no chance of them looking remotely correct. It is compounded by the fact they also change their helmets every year. You can spend all year memorising the flicks and colours if you want to, but you will soon have to start again! I don't get too offended by the complex designs but it is true you can't beat the simpler ones. Valentino Rossi has raced with collages on his helmets that could be considered works of art, but his simple sun and moon design is best. Similarly, I love the shades of red and white on Hamilton's helmet. I have a full size replica of his 2018 helmet and it does look absolutely stunning, but it is not actually a good design. Especially when compared to his early yellow effort. Edited by Knowlesy, 12 February 2019 - 08:57. Edited by krapmeister, 12 February 2019 - 10:30. Even if it's better than most of current designs... Stilll a little meh. It was never Alesi design. It was always de Angelis design. Alesi used it as a tribute to de Angelis. Actually... it exists. de Angelis' helmet had blue and red stripes; Alesi's was red and black. And Alesi's also had the drops on top of the helmet. Verstappen has had the "moustache" in his helmet but that is of course not seen very well when he's in the car. A similar feature was in his father's helmet. Looking through Lewis Instagram stories, may see more red at the top of his lid for 2019. Was just looking now, the top is entirely red almost. Also the flicks on the side are sharper, larger and more jagged. Not sure what to think at this point! No Jesus on the back though, at least! Edited by Knowlesy, 13 February 2019 - 13:29. I’m usually a fan of Hamilton’s design but this looks like it’s out of the bottas book of design. I checked his Instagram but couldn't get the level of detail you did, so maybe I'm looking in the wrong place? Any way you can share a link? It is on his video stories section, you need to click on his profile picture. That worked, thanks! Seems like a complete redesign. It's funny how the somewhat elegant design just gets ditched the moment he starts racing for Mercedes. Yeah. The very earliest designs in particular were just beautiful and distinctive. 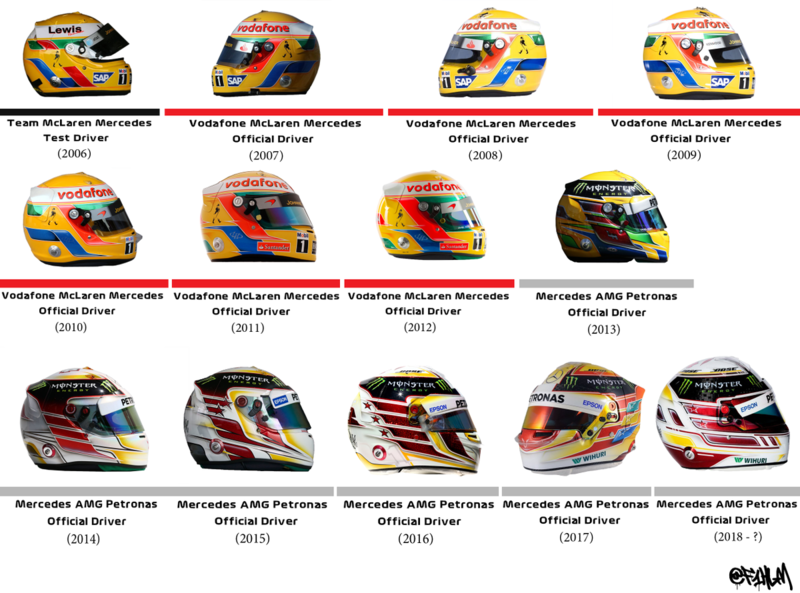 Maybe, but I am pretty sure the yellow - McLaren and white - Mercedes helmet will be remembered as his helmets, where other drivers have ten different colours and helmets in their career. Would be 200% better without the silly spikes. Jesus is still there. Never understood that one. Is it? Ah man, my eyes are deteriorating worse than I realised. Well, it is understandable given the man is fairly religious, even if it does look naff. The 'Still I Rise scroll is awful too. I love Lewis, but this is clearly a man who has motivational posters up on his walls. I guarantee he has a 'Love. Live. Laugh.' print hung up in his living room. Still, it works for him I guess! Edited by Jovanotti, 14 February 2019 - 09:31. Can someone share Norris's helmet guys? He is continuing to use his previous helmet design with some new touches. It also reminds me Lewis's helmets in McLaren days. Edited by Mc_Silver, 14 February 2019 - 11:33. I can do without the detailing in the blue areas and the numbers are a bit large. Not terrible by any means. 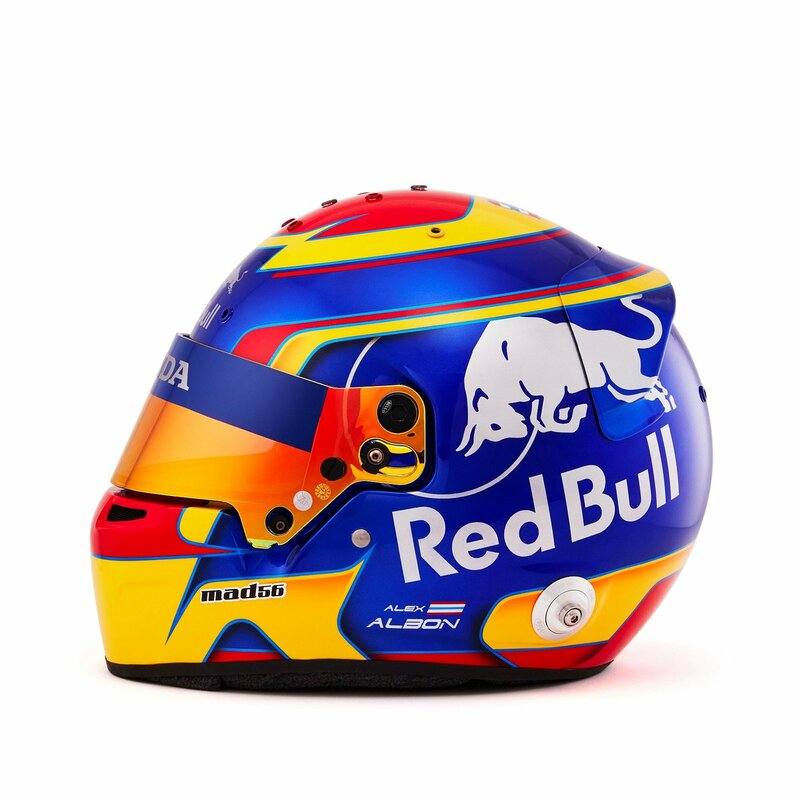 I actually liked Sainz's helmet. The background details don't compromise the simplicity of the design IMO. In motion, the detail will be invisible on Sainz's helmet. It is a minor quibble. Norris obviously LOVES Brawn GP. Edited by Knowlesy, 14 February 2019 - 12:40. 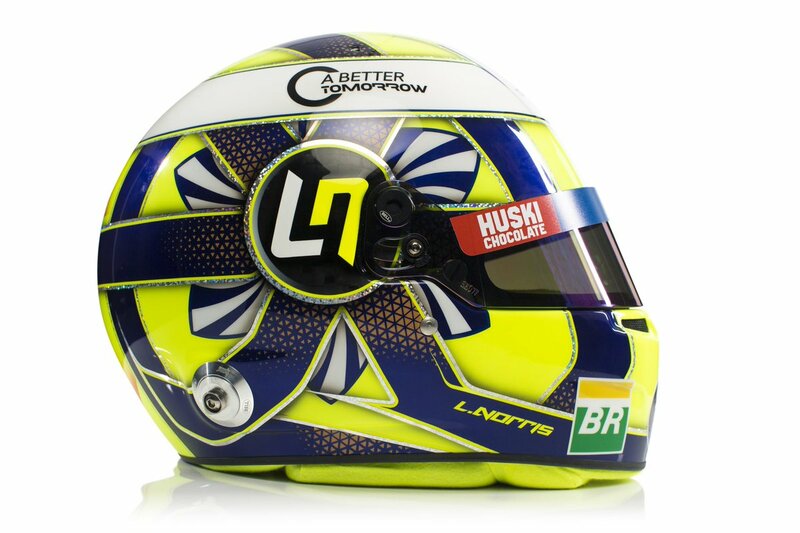 It looks like Valentino Rossi and Lucas di Grassi's helmets got together and had a baby. Edited by thegamer23, 14 February 2019 - 13:29. Grosjean has competition for the worst design of the year already. Edited by Jovanotti, 14 February 2019 - 17:07. Lando has a very original design, only ruined by the white halo. Kimi's helmet is looking promising. Sainz is also quite nice. Norris though is pretty bad, apart from the logo.